Casinos are magical places. 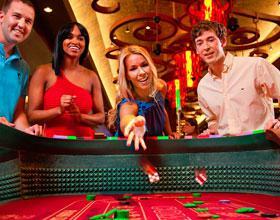 Walk right in and you’ll see people winning big, celebrating their growing bankrolls, and partying like rock stars. It’s a strange sight, especially considering the old adage, ‘The house always wins’. That old saying is definitely true. Casinos are businesses and they exist to make big money. Yes, people win. But in the end, the biggest winner is the house. So how are all these people actually making money? Why are there always people celebrating like champions at every corner of the casino? Why do we rarely see angry people leaving casinos in absolute tears? Well, the smart ones know how to get the best edge at the casino, and it usually involves making sure the casinos don’t get the upper hand. You see, in every casino game there are good bets and sucker bets. The trick is to know how to swing the edge over into your direction, or at the very least mitigate any edge the house might have. Wondering how to do that? Today, we’ve got the inside scoop on what winners do to maximize their advantage and put the house on notice. Follow these tips and you’ll be on your way to winning like these champions. 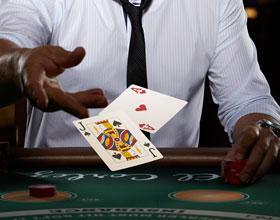 When it comes to getting the best edge at the Blackjack tables, the trick is to avoid all those fancy side bets. We’re talking about Perfect Pairs, Lucky Ladies, or the likes of which pay out extra cash. Some of these bets are attractive, especially when you stand to win 8 to 1 or even 20 to 1 payouts. Imagine dropping $5 and winning the side bet. That would be huge. Except the truth is that these side bets pay out less often than you think. You’re better off putting that side bet money onto the regular section of the felt and playing a separate hand, or simply adding to your original bet. Sure, you might not snag as handsome of a payout if that side bet hits, but slow and steady wins are more likely and that’s the way to a bigger bankroll. Craps can be an incredibly intimidating game, especially with so many possible bets on the table and general chaos happening with every dice roll. But at the end of the day, you really only need to know a couple of bets to understand the game and ensure you’re getting the best edge. If you’re a newbie learning the game or a seasoned pro who wants to limit the house edge. Stick with pass line bets or place bets of 6 or 8. These bets actually have a house advantage of less than 1.5 percent, making it perfect for players who want to grow their bankroll faster. If you do want to venture out beyond these bets, really familiarize yourself with what each bet is worth. There are some bets that come with a house advantage as high as 16 percent, which is ridiculous when you compare it to that 1.5 percent edge you’re getting with the above-mentioned bets. When it comes to games where you don’t have to think about house edge too much, video poker is definitely it. There really isn’t much house advantage to consider because you’re technically betting the same thing every time. You place your bet, get five cards, decide if you want to swap any of those cards, and then get paid out for any wins. But while every bet is pretty much the same, that doesn’t mean every game is exactly the same. 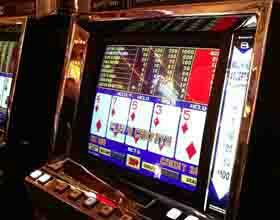 There are lots of difference video poker games, both online and off. Each game comes with different wild cards and different ranking systems. Always read the payouts before feeding just any video poker machine to make sure you’re playing a game that doesn’t give the house an extra edge. 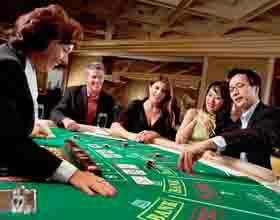 It’s one of the most straightforward casino games on the planet. You vs. the dealer. High card wins. At first, you might think that there’s no way the house could gain an edge on you at all. After all, it’s essentially 50/50, right? Wrong. The house gets a huge edge when you choose to go to war. If you end up with the same card, you can choose to go to war or just walk away. Before you decide what you want to do, the house has already taken your bet away. If you want to go to war, you’ll place the same bet you just placed. So if you had bet $10, you must now commit another $10. Now you’ve got $20 committed. If you win, you’ll get $20, but half of that $20 was yours. So you essentially bet $20 to win $10. To gain an edge, stay away from this bet. When it comes to games with inherently low house edges, Baccarat is the game you need to play. By focusing on the Banker bet, you’re basically taking away any big edge the house can gain. Player bets come with a larger house edge, but it balances out because Banker bets come with a commission on any wins. 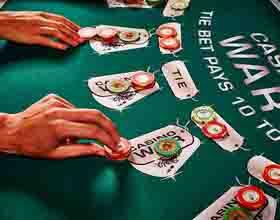 But there is a bet with huge payouts that many Baccarat players are tempted by. That’s the tie bet. If you place that wager and your bet pays out, you’ll win 8 to 1 payouts. Except the probability of hitting a tie bet is less than 10%. You’re essentially handing the house buckets of money by betting on a tie, so if you want to gain an upper hand, avoid this bet completely. At Palace of Chance, you’ll find all the games mentioned above, each available to play for free. All you need to get started is a free Palace of Chance account. It takes a second to sign up, so create your account and start enjoying these games, plus over 150 other great titles. You can even play for free to see how following this advice — or not following this advice — pans out.